Annotation: The Long Goodbye (1953) is a milestone in the genre. This novel demonstrated for the first time that hard-boiled fiction could serve as a vehicle for social comment and critique. 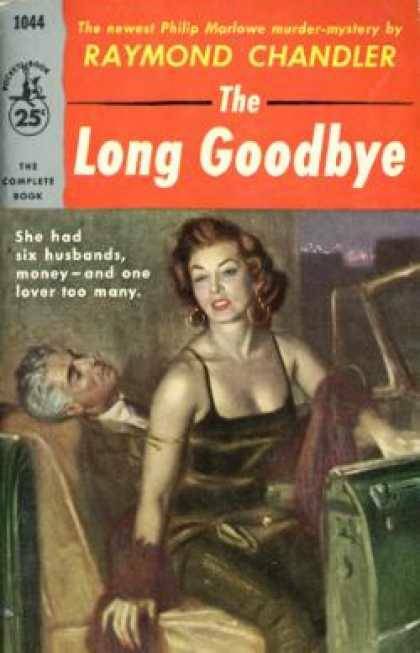 While the apparent plot is slower paced and less metaphoric than Chandler`s previous novels, the revealed plot shows him using his own life as a material, an autobiographical turn that prepared the way for Ross Macdonald. Marlowe meets and befriends English expatriate Terry Lennox, a drunk who has been abandoned by his ex-wife Sylvia, at The Dancers Club. Months later he spots Lennox drunk again, runs him home, and sobers him up, giving him traveling money to Las Vegas. Lennox sends repayment and re-marries Sylvia, after which Marlowe shares an occasional drink with him: during one, Lennox accuses Sylvia of infidelity. He next appears at Marlowe`s door in flight to Tijuana, apparently because he has killed her. Marlowe drives him there and stonewalls policemen Green and Dayton when he returns, spending time in jail. He refuses to cooperate with a lawyer sent by Sylvia`s millionaire father, local magnate Harlan Potter. Marlowe won`t talk even after the D.A. says that Lennox wrote a full confession before shooting himself in Mexico. A reporter suggests to him that there is a cover-up, which is confirmed by calls from the lawyer and warnings from gangster Mendy Menendez, an old friend of Lennox, who explains that Lennox was captured by the Nazis during World War II. Marlowe gets a letter from Lennox, which waffles on his role in the murder and contains a $5,000 bill. A second apparent plot begins when Howard Spencer, a publisher`s representative, hires Marlowe to baby-sit hack novelist Roger Wade (Chandler`s self-portrait). The alcoholic writer can`t finish his novel and is missing, but his stunning blonde wife Eileen provides a note about 'Dr. V' and details of Wade`s stays at drunk farms. Marlowe gets information on these places from an old friend in a big agency and narrows his list to three suspects. None pan out except Dr. Verringer, who is about to sell out so that he can support a manic-depressive named Earl. Spying Wade through a window, Marlowe saves him from crazy Earl. For this he collects a kiss from Eileen, and he learns that she knew Sylvia Lennox, which links the two plots. A lull follows, during which Marlowe meets Sylvia`s sister Linda Loring and her insufferable doctor husband. They argue about Sylvia`s murder and whether Harlan Potter wants the case closed, but a respectful friendship ensues. Marlowe sees the Lorings again at Roger Wade`s cocktail party, where the doctor accuses the novelist of sleeping with his wife. A scene follows, but Wade handles the blow-up well. Marlowe, however, won`t accept $1,000 to nanny the author through his novel. He doesn`t like the writer`s ego or his wife, who tells him her own story of true love lost. A week later Wade calls for help, and Marlowe arrives to find him collapsed in front of his house, with Eileen sitting nearby smoking. He and the house-boy put Wade to bed, and Marlowe walks away from an opportunity with Eileen. Instead he collects Wade`s drunken notes to gain insight into his problems. Then there`s a shot. Marlowe finds husband and wife struggling over a gun, the novelist claiming he attempted suicide. Dosed with drugs, he finally sleeps. Eileen invites Marlowe into her bed, but he declines. Linda Loring introduces Marlowe to Harlan Potter, who wants the Lennox murder closed. Marlowe demurs. Now information develops that Lennox used to call himself Paul Marston, and that Roger Wade had an affair with Sylvia. Marlowe, at the Wades with Eileen, finds the writer dead. His old friend Lt. Ohls treats the case as a suicide, but Eileen accuses Marlowe. More comes out about Lennox`s former life: he was married to Eileen and presumed dead in World War I, so she married Wade. But then he reappeared and she panicked.